One of Diva Dan’s amazing gifts is the ability to blend colours together. It comes from years of reading Home and Garden based magazines as well as working in the garden industry. He has a sense of colour combos and the excellent usage of having accent colours to make things go ‘POP’. Trust me… it’s a gift I envy! As a challenge, I asked Daniel to take Red Heart Super Saver and mix up the colours to create interesting colour blends. Each colour blend uses 5 different colours. It doesn’t mean you need to use all 5. It will give you perspective and an advance preview of what colours would do together. His large pictures will give you great help in the yarn aisles when deciding colours. He has provided the name of the yarn ball as well as the code number that appears on the package. Daniel has figured out over 70 different blends. You can see them all at Trendy Colours Collections By Diva Dan. We are wondering what other brands of yarn you would like Diva Dan to try to do trendy colour mixes with? Leave you comments below. This entry was posted in Advice & Tips, Yarn and tagged Advice, Colour, crochet crowd, Diva Dan, Mikey, Red Heart, Super Saver, Tips, Yarn. Bookmark the permalink. Yes, Caron Simply Soft (my second favorite yarn) and Lion’s Homespun (my favorite). I like making afghans, but I get bored with just one color. Homespun is great for afghans, but I have so much trouble figuring how to mix & match the tweeded colors. Diva Dan, please help! As Kathleen said, Amazing color coordinates. Love them. I’m always very critical of my colors. 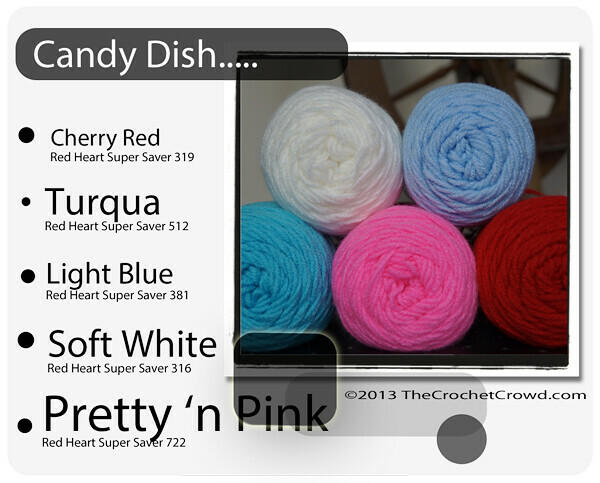 Red heart yarn is my #1 choice when crocheting, but I tend to change once in a while to Vanna White’s yarn. It’s softer for babies/ The colors Diva made are spectacular. Nice matches. I just printed the “chart” out for my reference when I go to different projects. Thanks Diva Dan. Amazing diva dan! You truly have a gift! color is something I really struggle with! Thank you! Would love to see it in lion brand vannas colors. Beautiful! Thank you thank you! Love the site and blog great job Mikey and Dan ! I would love to see colors from Caron’s simply soft yarn. I love the way it drapes and feels. And some baby yarns too! Thanks!! Red Heart with Love and a cotton yarn would be great! Thank you Diva Dan!!!! Love all the color combos. I can see them being used in not only in crocheting, but in redoing a living space. I like purples. I can see my bathroom in the Lilac Garden or Lavender Fields or Lavender Potpourri. All are so very nice. Thank you too Mikey and Cathy for all your hard work for the Crochet Crowd This site/group is very inspirational in my crocheting and in my life. I agree with Heartland by Lion Brand. Awesome colors. The color combinations are great once again! Question: is there a way the picture of the color combos can be larger? I can hardly see the names of each color. Just asking. Thanks! You can go to the Crochet Crowd Flickr account and few the pictures for the yarn color combinations. Any picture you want bigger just click on it. Lion Brand Heartland. Each individual color is beautiful, but there aren’t many light colors, so it’s hard to see how to mix multiples other than any color with the beigey color. Thanks for the link! They don’t carry this line at Walmart and I hardly ever go to Michael’s. It’s pricey but I can use it for personal projects. It has gorgeous colors. We will all be suggesting our favorites, but Bernat Super Value and Vanna’s Choice would cover a bit of ground in yarn feel, not pricey, and generally available. Thanks Diva Dan, and Mikey too! I am also color challenged love the wonderful color combinations Diva Dan came up with. I would like to see this in Caron Simply Soft and Vanna’s Choice as well. Thanks for everything you both do for the Crochet world!!! What about “Vanna’s Choice yarn? There are so many colors to choose from, it can get overwhelming! Diva Dan I am setting here waiting to be awarded all of the colors you have selected!!! I Love Color and Bright ones are my weakness and you balanced bright with tone down colors. Brilliant just Brilliant. I am waiting for all of the colors to show up on my door steps!!! Have a Nice Day !!!! Love all his combos! How about using Caron Simply Soft? Or a cotton yarn? Oh yes! I meant to say Caron Simply Soft but said Super Soft instead. I guess because I always think “this yarn is so super soft”. I, just love,love the colors that Diva Dans puts together. Thank You Diva Dan, as I am color challenged. Red Heart with Love would be great. There are a lot of colors, it’s affordable, and feels much softer than the Super Saver line. YES! Please do color combos with RH With Love. This is my favorite yarn right now. Love these combos! I would love to see what Dan comes up with using Vanna’s Choice! Yes, the Caron Simply Soft line please!